When I was younger, I had big bushy brows. And of course, as is the case with lots of things when we're young, I wanted just the opposite. So I tweezed and waxed my way to thin, arched, 90's brow perfection. BUT (there's always a "but" isn't there?) now that thicker, more dramatic brows are totally in style (thanks in great part to girls like Lily Collins and Cara Delevingne) and I can no longer grow them, of course I'm totally kicking myself for taking my natural born brows for granted. Plus, ever since I read a few years ago that thicker brows can make one look younger, I've been on the quest for thicker, fuller (but still natural-looking) brows. And for the past couple of years, I've been using Anastasia brow pencils to fill in and thicken my brows every morning (PS. If you haven't tried this brand of brow pencils, I highly recommend them). And I'll be totally honest with you, I literally don't leave the house without filling in my brows or throwing on a touch of mascara. I truly feel like even with no other makeup, brows and lashes make me look more awake and put together, and I feel a little more ready to face the world. But not gonna lie, it gets tiring and time-consuming doing the brow thing every morning... and really, who doesn't want to have an extra 15 minutes every day to catch up on the news, spend time with their fam or enjoy that second (or third) cup of coffee?? So all that to say, when I heard about Microblading last year, I was intrigued and anxious to try it. Waking up with the brows I've spent years drawing on? Yes please. And when I saw one of my favorite blogger's posts on her experience with Microblading and her awesome results, I was completely sold. So I started doing research on Microblading in Denver, trying to find someone whose work looked like something I would want permanently tattooed on my face (for at least two years) and was thrilled when my hairdresser Amie recommended Erica Eskeli of Eskeli Creative. After checking out Erica's Instagram page (you can view the Eskeli Creative IG page here) and her before and after photos, I could tell that she was both a perfectionist and versatile (in that not all of her brow work looked the same). I saw a great variety of thicker and thinner brows as well as different shapes and colors. And in my opinion, when looking for a brow artist (and that's definitely what she is! ), you want someone who can modify brow shape, color, thickness etc. based on a client's facial structure and personal preference. And in talking with Erica, I was even more impressed. She even brought up the option of using Microblading to fill in a thinning hairline or crown of the head, which is something I would never even have thought of, but is a great option for anyone concerned with minor hair loss. So I booked my appointment and started getting really excited. We began by looking at my natural brows and discussing what I wanted (think full, dark and straighter vs. super-arched) and I showed her a picture of what I liked for inspiration. In fairness, I do have decent natural brows, although they are thinner, slightly uneven and much more high and arched than I would like. So we talked about how to remedy that, to correct the unevenness (my left brow always seems to arch a little higher than my right) and create a straighter shape. Ps. For those clients who know exactly what they want, Erica encourages them to draw on their desired brows and she can follow that shape exactly. And for those who don't, she is happy to offer advice and recommendations. Once we agreed on the outcome we wanted, Erica showed me the microblade instrument (similar to the looks of an exacto-knife and not motorized like traditional tattoo instruments....the simple design allows for more control according to Erica) and she mixed my pigment color to coordinate with my hair. As far as color, pretty much anything under the sun is available and it's mixed just like hair color to achieve the desired shade. Then she had me lay down on the table and we jumped right in. 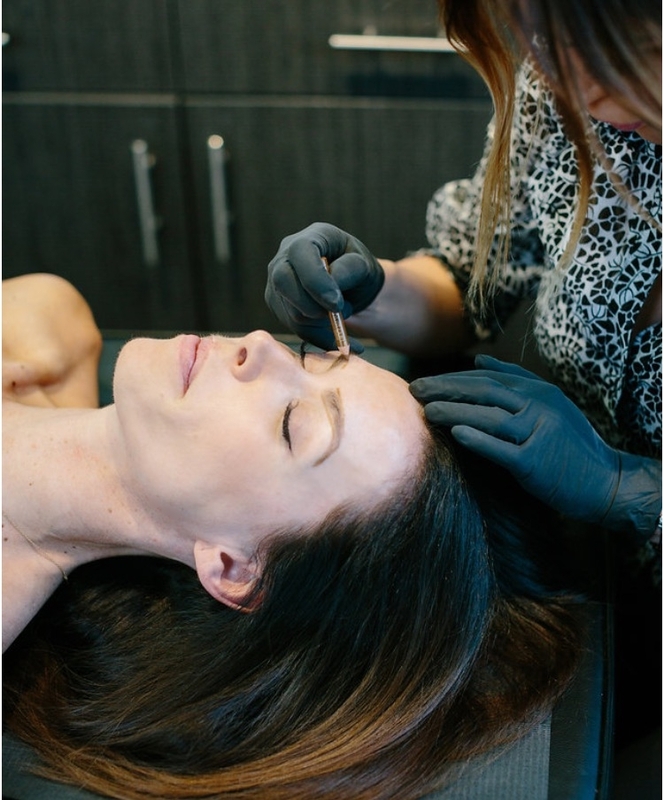 The way Microblading works is that the blade is dipped into the pigment and then small hair-like cuts are made in the skin allowing the dye to seep in, coloring the small stroke and appearing to look like an actual hair. This is very different than the permanent makeup of years ago where a brow would be colored in one solid shade with no hair-strokes visible. Bottom line is that even up very close it looks like actual hair. Erica did a first pass over both my brows and then let me sit up to see what I thought. After that first round, I still felt like my brows were slightly uneven and too arched so I laid back down and she added more strokes. Again I sat up, surveyed the results and commented on where I'd like to see more "hairs". This went on for a number of rounds until we achieved the look I had been hoping for. At one point, she handed me a brow pencil and let me outline where I wanted to add volume or fill in, which I really appreciated. And I also asked her opinion during the process as I trust her to be the brow expert. So that's my experience in a nutshell and needless to say, I would highly recommend Erica and her work. She is an absolute perfectionist, extremely thorough, easy to work with and you can tell she loves creating amazing brows! And I'm feeling like I've got a pretty strong brow game going on thanks to her! 2. How do I prepare for a Microblading appointment? There's not much you need to do to prepare except avoid alcohol, aspirin and blood thinners for a short time before. Erica recommends not drinking alcohol or taking aspirin for at least 36-hours before your appointment. My online research also recommended not using Retinol for a week prior as it can thin the skin. And taking Arnica for a few days before may also help with any swelling or redness but isn't a necessity. 3. How long does the appointment take? Your initial appointment can take up to two hours and your six-week follow up can be expected to last 45-minutes to an hour and a half based on the amount of touch up needed. 4. How long do the Microblading results last? Your brows can last up to two years with proper care. Things like excessive sun and lots of facial scrubbing can fade them faster and each individual is different as are their results. Of course, a follow-up appointment between six and 18 months after your initial treatment can help keep your brows looking fresh. Not gonna lie, it's not painless. The numbing cream does help a bit (especially with the first pass), but consecutive passes over the same area do start to sting. In my experience, it was more of a very irritated feeling rather than excessive pain, but still fairly uncomfortable. But once I saw the results, it was worth it. 6. How do I know what color my brows should be? Erica typically coordinates brow color with a client's hair color unless they request otherwise. She can mix virtually any shade. Keep in mind that at the end of your initial appointment, your brows may look darker and bolder than you'd like. (I also noticed that mine seemed to get darker as they scabbed over and then lightened as the scabs began to fall off.) Once they have completely healed the pigment usually ends up about 30% lighter than when you first leave the appointment and most clients come back to Erica requesting a darker shade. 7. Will Microblading damage my natural brows? No, in fact it could even help with hair growth. In the event that you have spots where hair used to grow and no longer does, Microblading could potentially help stimulate that hair growth. Obviously no guarantees, but just like injections can often help stimulate collagen in the injected area, it's possible that putting small strokes in the skin could stimulate hair growth where it used to grow previously. 8. What is the healing process like? When you leave your appointment, your brows may be slightly red and swollen (although my redness and minor swelling went away within an hour or so). Because the process requires small cuts to be made in the skin, these cuts do scab. So you will have tiny scabs throughout the brows that will eventually flake off. It is vital that you DO NOT mess with the scabs and let them fall off naturally in order to keep the look of the distinct hair strokes and have them heal properly. Picking at the scabs can cause the lines to blur or leave holes where there is less pigment, and the overall results can be affected. 9. How do I care for my brows after my appointment for best results? The great news is that you will be given an after-care instruction sheet with specifics, but the key is to keep your brows completely dry until the scabs fall off on their own (this could be 5-15 days....my scabs started lifting and coming off at about day 9 and continued til about two weeks post-appointment). This means no showering, washing your brows or sweating profusely (you also don't want to work out for the first day after as it can raise your blood pressure which can cause the scabs not to clot properly and can negatively affect healing). You should also not touch or brush your brows for the first 24-hours as you don't want any chance of infection or opening the cuts as they begin to scab. Over the next two to five days you may experience flaking, tenderness, dryness and itching, swelling or redness but it shouldn't be severe. (I personally did experience quite a bit of itching starting at about five or six days post-appointment but tried my best not to scratch at them and it got progressively less as the scabs came off). When washing your face, use a gentle cleanser and wash around the brows, avoiding them as much as possible. If they do happen to get wet, just gently pat dry with a clean towel or tissue. One really cool thing that Eskeli Creative offers is that for the six weeks following both your first Microblading session and your six-week follow-up, Erica's assistant Maranda will do half-price washes and blowouts in order to help keep the brows dry. So for just $15 you can get a shampoo and conditioning treatment (no blow-dry) or for $35 she will do a shampoo and blow dry. Such a great idea right? This helps cut down on the chance of getting the brows wet in the shower and just makes you feel all glam and pampered besides. 10. What happens when the scabs fall off? Again, it's super important to let the scabs fall off naturally for optimal results. When they do, it may look like part of the tattoo is gone. Don't worry, the strokes should return within three to four days and anything that still appears faint or faded can be touched up at your six-week follow up appointment (and it can take the skin up to the full six weeks for it to fully heal). Once the scabs do fall off on their own, you can start washing over your brows, applying makeup to them etc. 11. What if, after living with my new brows for a little while, I decide I want to change the shape, darken them, thicken them etc? This is another benefit of your six-week appointment. At that time, you and Erica can edit the shape, add more hair strokes and alter the color if desired. And like Erica told me, your brows should look like the brows you want to wake up with, not necessarily the brows you'd want for a night on the town. You can always still fill them in with pencil to darken or thicken when you have a full face of make-up on. 12. Who would be a good candidate for Microblading? That's easy....pretty much anyone who wants a little more brow definition and wants to save time filling in their brows. But if you have concerns, I'd suggest scheduling a consult to talk to Erica and get all your questions answered. 13. Was there anything that surprised you or that you didn't expect during the process? Yes, I was actually surprised when my eyes watered and my nose started to run. Erica told me it's because there is a sinus pressure point on the forehead that she puts a little pressure on when she's working on the brows so that can cause a little sinus stuffiness, running etc. And I believe some of the watery eyes came from my brows feeling irritated with multiple passes over them. But both went away as soon as we were done, so no major issues, but something I hadn't expected. 14. Where is Eskeli Creative located? Erica's space is located in Urban Luxury Salons at 403 16th Street, Denver CO. It's on the corner of 16th and Tremont on the 3rd floor. 15. How do I schedule? The best way to schedule an appointment with Eskeli Creative is to text Erica at 702-523-4020 or email her assistant Maranda with questions at maranda.eskelicreative@gmail.com. You can also read more about Erica here and view her FB page here (and her IG page is also linked above). Ok, now that hopefully all your questions are answered, on to the really great stuff! Because I truly believe in Erica's work and am so happy with my brows and my Microblading experience, I'm super excited to be partnering with her to offer you an awesome discount of 20% off your Eskeli Creative Microblading treatment when you schedule your appointment within the month of June (you must mention this blog post when you text to schedule and offer expires June 30th)! Thanks so much for reading and I'm wishing you all beautiful brows and the best week! My natural brows are high and arched....I desired them straighter, fuller and slightly less arched. Results (5 days after).....Will still be doing a six-week touch up at the end of June, but I love 'em!